Infotainment systems are tricky little things to design; most customers won’t notice when it works well but will definitely notice when it screws up. And Cadillac’s CUE infotainment system has had some tough critics. At this year’s New York Auto Show, I sat down with Brian Ullem, the product head of global infotainment at General Motors, to find out how Cadillac plans to right this wrong. First things first: don’t call it CUE anymore. It’s referred to as the “next generation Cadillac user experience,” which is super confusing because that still spells CUE and the word “CUE” flashes across the car’s screen when you turn it on. Anyway. Ullem said that one of the greatest complaints customers had regarding the last generation system was the lack of response to input. The screen just didn’t react smoothly or quickly enough to tactile input to be satisfactory. The new generation is much quicker and more fluid. And it’s been simplified even further. Notice the handy dock at the bottom of the screen that not only includes a home button, but quick and easy access to your music, navigation, phone and climate controls. In the old CUE system, if you navigated away from the screen you needed, you needed to go to “home” first before you could select where you left off. Admittedly, this was annoying. Additionally, the new system now offers a summary view, which puts everything you need to see on a single page. It’s also easier than ever to set your favorite radio stations and frequently used audio apps so you don’t have to go hunting for them anymore. The user profiles, if you let them, will learn your driving habits so it will route navigation directions accordingly. For example, if you like using a shorter route, it will point you on shorter routes. You’ll also get traffic and points of interest updates from the cloud. You tap the phone icon and if your phone is paired, it’s paired. If it isn’t, it brings you to this menu, where you can easily see how to pair your phone. It’s a goddamn green box, for crying out loud. Seriously—if people still have trouble figuring this out then I don’t even know what to say anymore. Ullem says he isn’t threatened by the popular use of Apple CarPlay or Android Auto. 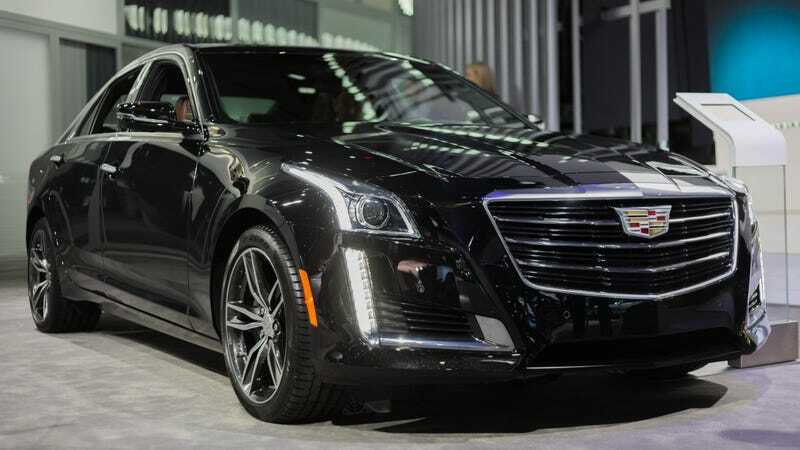 He sees the new Cadillac system as an augmentation of the two. This was nice to hear, especially for cavepeople like me who don’t bother with the car apps. I personally rely on a car’s system for all my entertainment and navigational needs. It’s nice to see automakers still improving those systems and making them easier and easier for customers to use. I didn’t feel that CUE needed updates. Like most, I neglected to read the owner’s manual and figured things out just by playing with them. But perhaps this is because I’m a millennial and I’m used to messing around with different interfaces. Maybe some just need things as simple as possible in order to land with the maximum number of people. The updated system debuted in the 2017 CTS and will appear in the 2018 XTS and ATS.